Neon signs are made by heating thin four-foot-long glass tubes and bending them into letters or shapes. 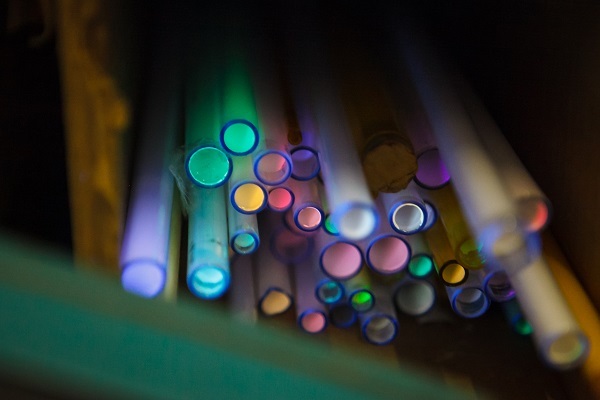 These tubes are then “bombarded” with electricity to burn off impurities and create a clean, vacuum-tight interior. Next, the tube bender fills them with a noble gas. 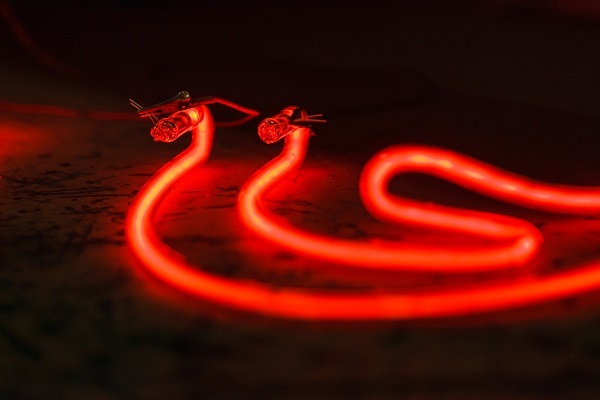 Neon is the most common and glows red. Other colors are made by filling coated glasses with argon, which is naturally blue. Without interruptions, Heist can bend a new piece in one or two days. 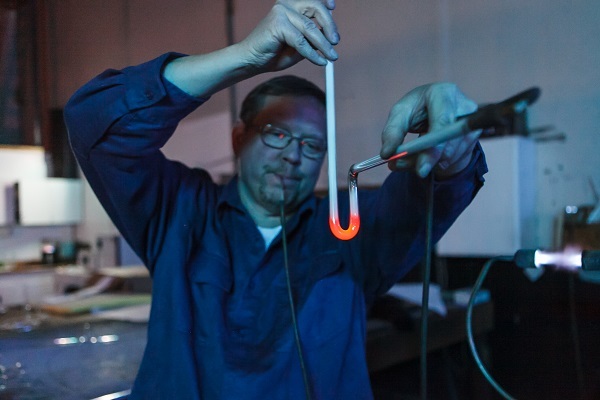 Though neon means “new,” the craft of bending is old, with few modern advances. Mastery of the art is a slow process. 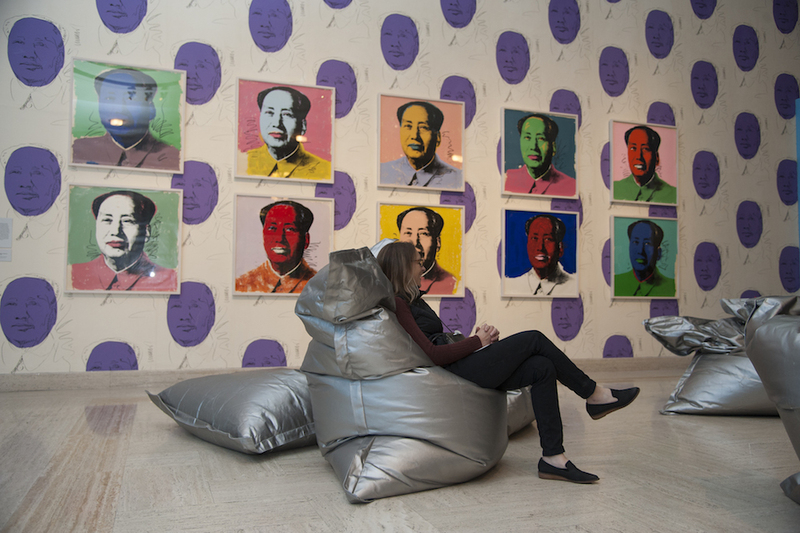 “You have to invest years to mentor someone, and the demand really isn’t there,” said Heist. “I just got lucky,” he said about his tutelage from his older brother, Mark Heist. 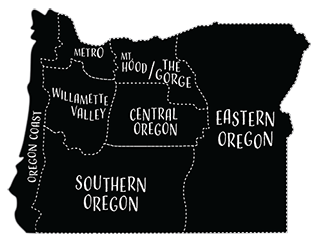 After Heist got out of the U.S. Navy in 1985, his brother invited him to Portland to work with him at a neon bending company. 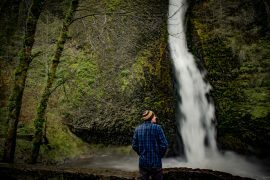 His hometown, The Dalles, offered nothing more promising, so he went. Besides sweeping floors and making deliveries, Heist also bent “channel letters,” where the neon tubes are hidden behind the plastic casings of letters of an advertising sign. Evenings he practiced bending neon for more complicated patterns where the exposed neon would undergo more scrutiny. 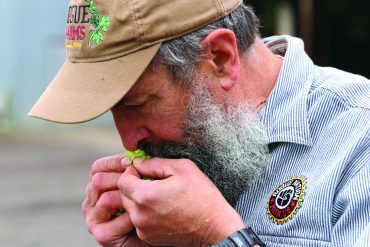 Two years later, his employer’s business sold, and Heist and his brother created Neon Distributors in the fall of 1987. 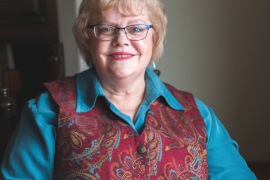 “I sold everything I had, put it in the business and went into it as partner,” Heist recalled. His brother became the figurehead and manager of the business. Heist became the primary bender. When his brother died in 2012, Heist continued. It hasn’t been easy. 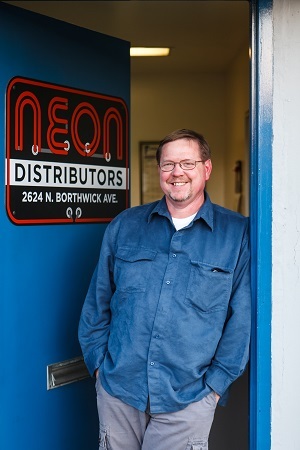 Hard work, long hours and the absence of vacations keep Neon Distributors humming. Heist gets to the shop every weekday by 4 a.m. After answering emails and catching up on paperwork, he moves to service repairs, which increase during winter. Currently, he has plenty of projects because of recent Portland wind storms which decimated many neon signs in the area. The demand for neon has ebbed and flowed over the years. 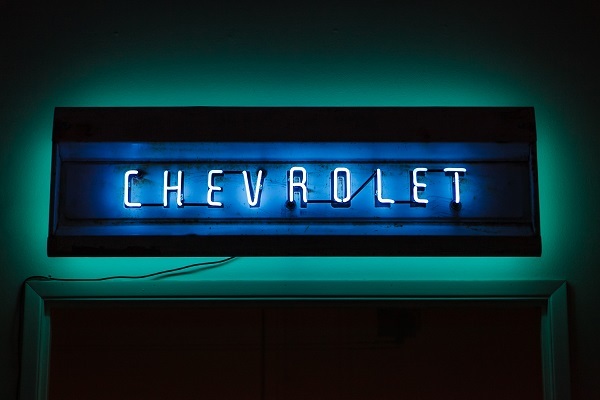 From its sensational debut, neon signs were popular in the United States until 1960. 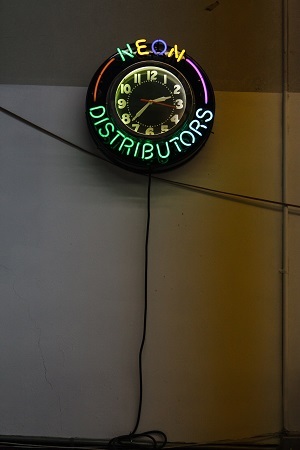 The glitzy ’80s rekindled demand for neon, just as the Heist brothers formed Neon Distributors. Though its creators are aging, neon demand is hot these days. 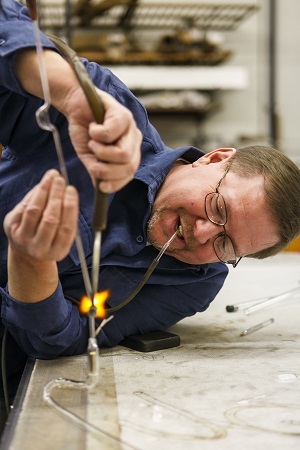 He flips on a variety of torches and manipulates a corked-off glass tube over a cross-fire which he uses for right angles, double-backs or drops. 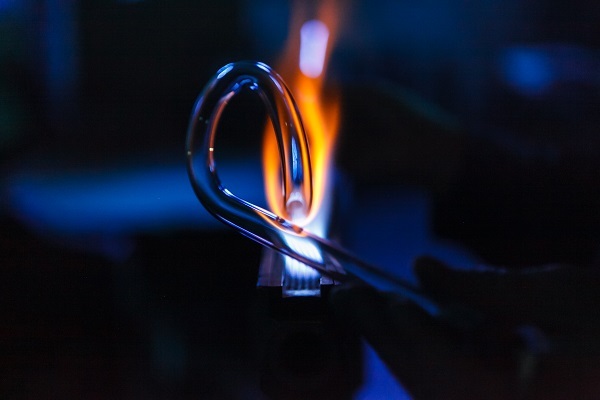 Moving the tube across the fire in alternating motions—sometimes side-to-side, sometimes forward and backward—he evenly heats a specific spot, while blowing through a latex rubber hose connected to the tube to keep the diameter of the glass constant. When he is finished, he lays the piece on the table and places blocks upon the bent tube to give it a uniform appearance. One tube letter may contain seven to ten small bends. If more tubing is required, another piece is welded onto it using a hand-torch. This process is intricate and unforgiving. 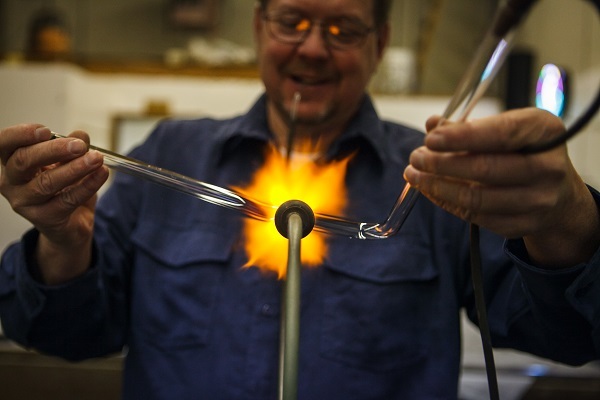 Once a spot or section of a glass tube has been bent, it quickly hardens and cannot be reheated and re-bent. A mistake means a wasted tube and a loss of costly time. The finished product must be vacuum tight to operate. When the entire piece is assembled, Heist takes it into an adjacent room of his 3,200-square-foot shop to fill it with gas. First he sends a jolt of electricity through the tubes to burn out the impurities. Then, he seals off the ends with a small flame. The final step is painting parts of the sign black to hide segments which the viewer shouldn’t see. When completed, Heist holds up the finished product to inspect and, perhaps, admire it.